In a clear breach of an explicit pre-election promise by Tony Abbott, Malcolm Turnbull has slashed the ABC’s budget — but don’t expect 7.30 to hold him to account. Managing editor David Donovan comments. THE ONLY WAY to understand Australian politics is with a strong case of cognitive dissonance. Follies and faults that in one side are pilloried relentlessly are excused and glossed over when committed by the other. Take yesterday when, in clear breach of an election commitment made by Prime Minister Tony Abbott on the night before the last election, Communications Minister Malcolm Turnbull slashed the budgets of the ABC and SBS — in the case of the ABC by a whopping 5 per cent, or $254 million over five years. The circumstances compare almost precisely with a commitment made by then Prime Minister Julia Gillard just before the 2010 election, in which she said there would be “no carbon tax” under a Government she leads (although in the next breath, she did promise to implement a carbon price). Led by Abbott, who repeatedly labelled her a liar, Gillard was battered by all Australian mainstream media for three years for this alleged broken promise. Never mind the so-called carbon tax she implemented was actually a fixed carbon price, to much of the media and the braying rightwing pack, Ms Gillard became “Juliar”. 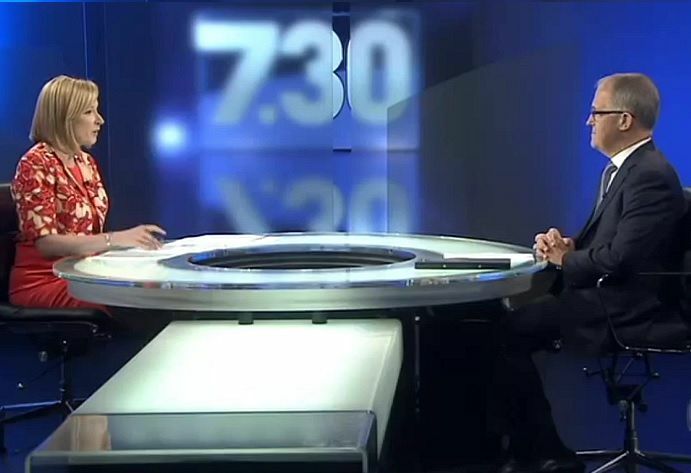 So, when Malcolm Turnbull made his way into the very studios about to be shredded by his decision last night, to appear on ABC 7.30, one might have expected him to receive a fierce grilling from host Leigh Sales. In fact, he received nothing of the sort. Sales should have been ready for this response, because Turnbull used exactly the same template to try to fend off this question on the ABC’s Q&A programme on Monday night — receiving howls of derision from the crowd and panel as a result. Turnbull was clearly on the ropes, uncharacteristically tentative — embarrassed even. He knew a commitment made by the leader while all of Australia was watching, before a Friday night football match on the night before an election, superseded statements made by less senior spokespersons in previous anonymous, mostly unreported, press conferences or doorstops. But he was in a bind; he had to say something, no matter how absurd and this drivel was the best he could come up with. It was time for Sales to go for the jugular — if not for the Australian community, then for the many colleagues who will be losing their jobs over this calculated act of political bastardry. LEIGH SALES: So, voters have misinterpreted then. They shouldn't have taken "no cuts" as no cuts, they should've been parsing Mr Abbott's comments and Mr Hockey's comments and your comments to try to figure out exactly what that meant? MALCOLM TURNBULL: Well, well, look, you know, I mean, I've defended the Prime Minister on this today and earlier in the week. I think you've got to take his comments, which … look, I mean, what he said, he said, and, you know, it's there, it's on the record. But you've got to take that in the context. And I can only assume that what Mr Abbott was referring to or was thinking about, anyway, was the proposition that there would be cuts in - with the intent of reducing ABC services and we've ruled that out. LEIGH SALES: I don't want to get bogged down in this 'cause I want to get to the detail. MALCOLM TURNBULL: Yeah, I know it's — yeah, sure. LEIGH SALES: But you must understand that for voters, when someone says "no cuts", you think no cuts. MALCOLM TURNBULL: No, look, I understand that. But to accept that Tony Abbott meant the ABC and SBS, out of all of the agencies of government, would be exempt from any savings measure, to accept that, you would have to assume that he had decided on the eve of the election to overrule and contradict the very carefully considered statements that Joe Hockey and I had been making. Now, that's a big call too. LEIGH SALES: OK. Alright, let's drill down into some of the detail…. Perhaps because of her occasional ferocity, many people appear to believe Leigh Sales is a good interviewer. Frankly, I do not. It is difficult to imagine formers hosts Sarah Ferguson or, heaven forbid, Kerry O’Brien allowing Turnbull to leave that studio last night humming a merry ditty and doing a little tap dance. In all our history, there has never been an Australian government so flagrantly willing to break election promises. And, similarly, there has never been a media set so ready to gloss over a Federal government’s continual lies, obfuscations and obvious deceptions — although they weren't far off it in dealing with John Howard’s “core and non-core” promises and “never ever GST”. For Australia’s commercial media, perhaps one can understand their relentless PR spin for one side of politics ‒ not forgive, mind you, just understand ‒ as clearly there is seen to be a commercial imperative in having a government aligned with business. But the ABC? After having its budget trashed by a Party it doggedly promoted prior to the election? What does it have to lose? This Government should be famous for its broken promises. Tony Abbott should, in all fairness, be scornfully derided wherever he goes ‒ like Gillard unfairly was ‒ for his relentless, cynical, mendacity. The fact they and he are not, and many in Australia are allowed to believe the fiction that this country essentially has an honest government, making hard choices to deal with an urgent inherited debt crisis ‒ itself a fiction ‒ is down to interviewers like Leigh Sales continually letting the Government off the hook. Is it incompetence — or is there something more to it? Whatever it is, if I was one of Leigh Sales’ colleagues ‒ perhaps one less sure of their future employment than she is ‒ well, I wouldn’t be buying her a drink tonight.